The city of Taipei is one of the most modern yet traditional Chinese city in the world, and people come from many countries to experience what the Chinese can achieve when given the freedom to build upon our historical traditions, and combine them with modern technology, commerce and understanding of the 21st century. As with any capital city you will fine a whole range of different activities in the city, some harking back to its origins and some expressing the current aspirations of the people. Uniquely Taipei, however, is the center of the Chinese cultural heritage that was saved from the mainland and is here protected for the future. The Shilin district being situated between the commercial centre and the wilds of the Yangmingshan National Park it shows the character of the people as they relax in the suburban environment, still well connected to the city center via the excellent public transport, but also close to the green countryside. The Temple is actually inside the Shilin District, right at the end of Danan Road just past all the food stalls. View the colorful red lanterns in the evening. Chiang Kai-shek Presidential Residence, or Shilin Residence, is just north of the market area. The grounds of the residence are famed for their flowers. To the south is the Grand Hotel of Taipei which is a modern yet traditional building visible from many places in the city. Well worth a visit even if not staying there. 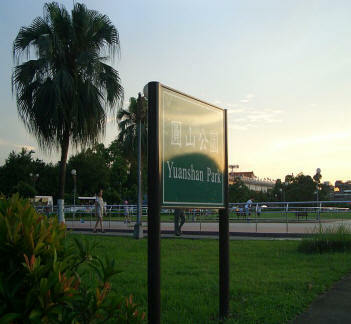 Beside it is the green Běiān Park. National Revolutionary Martyrs' Shrine is also nearby and has a changing of the hard on every hour during the day. It is an impressive Asian building.